K9-Playtime is a local, family owned business located in Hudson, WI. We are dedicated to the highest standards- the devoted and experienced team here at K9-Playtime guarantees your dog will be safe and comfortable. Welcome to K9-Playtime! We are a homegrown, family run business. Here to serve pets and pet-parents, we are dedicated to the highest standards of care and safety. Our devoted and highly-trained staff guarantees you will feel comfortable and confident in choosing us to be your pet’s home-away-from-home! Thank you! Kim is a life-long St. Croix County resident and she is excited to join the community of small business owners in Hudson. She graduated from Globe University with a degree in Veterinary Technology, has worked at a local veterinary clinic over the past seven years, and returned to Globe as an instructor. She and her husband Bob own a hobby farm where they raise beef cattle and horses. 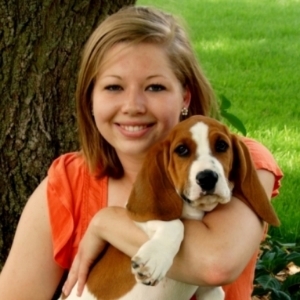 Bekah graduated from UWRF- she majored in Agricultural Studies with an Animal Science minor. She has trained dogs in 4-H programs and has been schooled in "positive reinforcement" training methods. Along with a passion for animals and their care, she is dedicated to the well-ordered business aspect and will put her administrative skills to work to keep pet parents informed and organized. training and knowledge of canine behavior, she is a perfect fit to oversee day-to-day activities. If you are interested in joining our team, please complete this Excel application and email to info@k9-playtime.com or print this PDF application and drop at our office. We are always accepting applications- all submissions will be reviewed and we will respond when positions are available. The program recognized us as an outstanding small businesses serving the Hudson area. We are SO honored to receive this recognition. organization that have helped build our business. Our team is now a part of an exclusive group of small businesses that have achieved this selection.